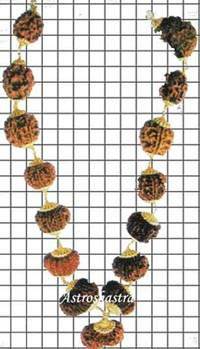 An Auspicious energised mala of one Twelve Mukhi and One Eight Mukhi Rudraksha to invoke the blessings of Lord Ganesha and Lord Sun. These bead increases the strength of character and mind and help achieve happiness, fame, good health and increase confidence. 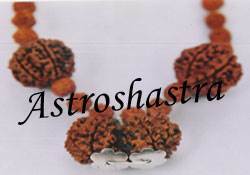 By wearing eight mukhi rudraksh all the pleasures increase and all the difficulties diminish. Sun god is always kind to the wearer of twelve mukhi Rudraksha, such a person always enjoys wealth, prosperity and worldly pleasures. 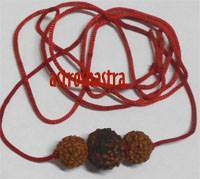 On these two beads , an arrey of two seven mukhi and two six mukhi with the small beads of five mukhi Rudraksha in red coloured thread. 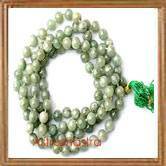 Wearer of this enegised mala is blessed with all kind of material wealth and inner happiness.